The structured interview is a standardized interview process that comes with several advantages and disadvantages. It is a quantitative research process, that has been employed in every survey research and can be presented in the same way. The aim of the whole approach is to make sure that the interview has been presented in the same manner. Keep reading this post to know more about the research method and procedure. What are Structured interviews and what you must know about them! 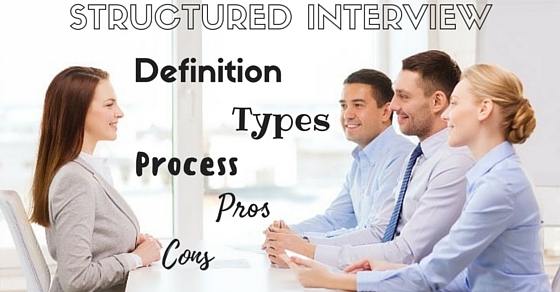 Structured interview meaning can be understood by its name itself. A structured interview is where all the questions have been prepared from beforehand. This is different from an unstructured interview where there is hardly any specific set of questions that is predetermined and that the interviewer will be able to change all questions at whatever time, they want to follow up questions depending on the responses of the interviewee. In a structured interview, the same category of questions is asked and they are prepared before the interview. Here variations of responses are minimal and very less open-ended questions are asked. A neutral role is played by the interviewer and he is very friendly and casual in the process. At the same time, the interviewer does not open up his opinion in the session. There are also several ways in which you have to conduct the structured interviews. You can do them on the internet on Skype or use computer programs. Videophones can also be used. Structured interview questions could be open as well as close-ended. The close-ended questions will ask all respondents for the right piece of information and could also require the respondent to maybe choose the right list of alternatives. If we are considering a close-ended question, it could be something like “are you taking drugs recently? They could be prescribed or not” and here the person who is responding shall say YES or NO. Literally, there shall not be any room for further elaboration. Open-ended questions happen to those which can be answered in several ways. The respondent will have to elaborate and give you thoughtful answers. An open minded question that interviewers may also ask you include “can you talk about the symptoms that you have been experiencing in the last few weeks”. The respondent will also list the symptoms they want to talk about and will not limit themselves to a couple of responses. Before you start a structured interview, you will have to check and make sure that you have clarified the focus as well as the objective of the whole interview. In other words, what happens to become the focus of the interview and what are your goals? You will have to check and figure what method you will be using to conduct the interview. If you want, you may also come with a schedule which contains a list of all the questions that you will be asking during the interview. When the interview begins, it is very important to make sure that you are sticking to the schedule of the interview. The structured interviews happen to be standardized and have a fixed format as well. The questions will also be given in a specific manner. That could also mean that every person will be interviewed and will be asked the same set of questions which has the same order and the same way too. When you do that, the reliability can be increased along with the consistency of all your interviews. Here are some of the biggest advantages that come with structured interviews. If you are attending one or are preparing for this, make sure to read this section properly. Since structured interviews mostly come with standardized questions, it makes the process much simpler and efficient. All people who respond will answer the same kind of questions so that they can be compared with others easily along with the trends. Often the data is not great or reliable. But since the structured interview lets you repeat and check the data constantly, the problem will be solved. The best thing about this interview is that it can expand the line of questioning. The respondent can give you much better and detailed responses. This is one of the biggest and most wonderful benefits that come with structured interviews. Structured interviews always manage to give you a better and much more comprehensive view of the whole issue. It is beneficial for those who have difficulty while trying to understand the subject and an eye-opener as well. With other types, you can’t read such situations well. But with structured interviews, that is very much possible. The trained interviewer may also rephrase the question if he wants in order to alter the manner or the tone so that he can sue the ones who are interviewing. A structured interview is reliable, the results are easy to evaluate and analyze and can be replicated as required. Moreover, the process is quick and more amount of details are generated. The level of understanding of the respondent or applicant can be understood for a specific topic. This type of interview is slightly in depth and hence can be beneficial. A structured interview is considered as one of the authoritative forms of formative assessment. By following this method, the idea and thought of the responder can be found out before going in for a second methodology. This method also adds to gather a lot of information for them. This type of interview is also beneficial for ones who have a flair for detailed research. In a structured interview process, the applicant is able to prove and present their skills and experience for the job. The other advantage is that in a structured interview process, the interviewer can get to know all initial as well as professional details that are required to know. This type of interview covers up a wide topic area and is cost-effective when made a comparison with a semi-structured interview. Since they are tick box style answers, the interviewees do not require extreme training. Some other advantages of the structured interview include relatively quickly to use and very easy to create, interpret and code. Secondly, there will be no formal relationship between the people who is responding as well as the researcher with the latter who knows exactly what is needed from them in the interview. For example, if the respondent is not willing to answer the question, the researcher will be aware of the reasons for failure and the need to answer all kinds of questions. The researcher will not have to worry about the rate of responses that are biased. The thing with structured interviews is that both the hiring managers as well as the candidates of the job tend to get disappointed when they see the rigidity that comes with formal interviews. Hiring new managers will mean that you will have to understand the prospect of the person personality as well as a good idea of their interpersonal skill as well as general demeanor. The candidates want to be able to develop the rapport with their hiring manager as well. Because of the emphasis and structure of keeping their interview well focused, there will be very little room to build up a proper relationship. The thing with structured interviews is that it makes far more sense in the lower level. The same applies to technical positions. Whether it is sales, service or other positions that need regular communication as well as personal interaction, a structured interview is something that will reduce your ability to see and check a persons personality and their qualifications. They don’t just have any formal interviews which leave out basic elements that include rapport and small talk as per the formal interview definition, the process will cause all candidates to feel tense. Another thing with structured interviews is that they tend to become very intimidating to even those who are experienced or do qualify as job candidates. This is actually quite true if you have already hired a committee opposed to someone who has just one hiring manager. This entire formality could even lead to a candidate to become preoccupied that comes with giving accurate answers. When the interview is being processed, the ability of the candidate to give away the right depiction of skills, confidence, and persona may also diminish with time. The goal of all interviews is to hire the best type of candidate which makes the process of the interview a problem and inhibits the person’s ability to do their best. A final problem and major concern we get to see in structured interviews is that the questions are usually prepared by the staff but the managers, as well as the committees, are the ones who will handle the interview and conduct them. This also could mean that the managers are not feeling all that supportive or comfortable when it comes to a few questions. Choosing collaboration between the HR as well as hiring managers could become a disadvantage. The quality of the questions plays a major role which assists in the use and quality of information. The main disadvantage here is that the interviewer cannot add or delete questions as they like as it may affect quality. It is quite complex when a deep look is taken about the format of questions when issues and opinions are to be evaluated. Open-ended questions are another aspect where the answers are also limited when compared to any other method. There is limited scope for the applicant or respondent as they cannot answer the questions in detail or in-depth. A structured interview is one which is mainly dependent on the collection of a large amount of data and hence they do not assess or test the communication skill of the candidates. One another disadvantage of structured interview is that a large number of applicants are to be interviewed to make a comparison and hence it is time-consuming and also needs more questions to be designed. Moreover intensive resources are to be used in the process. The other main disadvantage is that people’s reasons cannot be explored for any views or feelings for the issue. The designing of questions is done by experts. Other disadvantages include way too much time consumption. It could become time-consuming in case the sample group becomes very large and might not be able to able to deliver on time. The quality, as well as the usefulness of the information, will be dependent on the quality of the question that is being asked. The interview will not add or subtract the questions. This brings the post to an end. If you have enjoyed reading the article and have found some benefit from it, do let us know by dropping a comment below. On that note, good luck and make sure to read the post thoroughly. In case you have any queries regarding the post or would like to tell us something, do inform us as soon as possible. We would love to take care of all your queries.